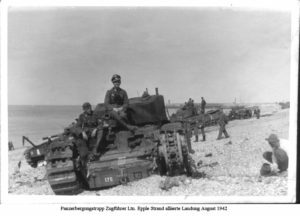 In a recent article in Maclean’s magazine, author David O’Keefe contends that the rogues gallery of people responsible for the disastrous Dieppe raid in August 1942 included Winston Churchill. Mr. O’Keefe adds that the major objective of the raid was to “pinch” a German four-rotor enigma coding machine. The attack at Pearl Harbor, on 7 December 1941, assured American entry into World War II. Referring to his reaction at that time Churchill later wrote: “So we had won after all.”1 Yet in the early months of 1942, an Allied victory was far from assured. On the Eastern Front the Russian Army was hard-pressed to withstand the German onslaught which threatened Moscow. Soviet Premier Joseph Stalin appealed (or to be correct, demanded) an immediate second front in Western Europe. This, he argued, would divert substantial German troops away from the precarious Eastern Front. Soviet Foreign Minister Molotov met with President Roosevelt in May 1942. He emphasised the dire situation his country faced. Roosevelt, concerned that Russia might make peace with Germany, promised a second front that year. The promise could not be carried out, for there were insufficient troops and inadequate landing craft. Still, something had to be done, and on 9 March Roosevelt wrote Churchill to urge action. From his earliest days as prime minister, Churchill wished to “set Europe ablaze.” He asked the head of Combined Operations, Lord Louis Mountbatten, to “press forward as opportunities arise.”2 One opportunity, in February 1942, was to destroy the dry dock at Saint-Nazaire in northwest France. This was a spectacular success encouraging Churchill to ask Combined Operations for a more ambitious attack. On 4 June Churchill held a conference on the operation, with General Sir Alan Brooke, Chief of the Imperial General Staff, Mountbatten and Hughes-Hallett. Churchill had concerns. “He asked Mountbatten whether he could ‘guarantee success’ to which Mountbatten replied that he could not.” But Hughes-Hallett, who had trained with the Canadian troops, assured Churchill that they would “fight like hell.”4 Brooke lent his support, and Churchill gave his approval. Montgomery left England on 10 August to take command of the Eighth Army in North Africa. His replacement was the commanding officer of the First Canadian Corps, General Harry Crerar, while the actual commander of the operation was Canadian major-general John Hamilton Roberts. Weather prevented launching the enterprise on July 3rd. With many thousands involved, essential secrecy could not be maintained, so the operation was cancelled. Subsequently, a decision was made to re-launch the operation. Germany would not expect it, the British believed, and the troops, already trained, could be taken straight to the ships. On 12 August Churchill flew to Moscow. His unpleasant task was to inform Stalin that there would be no second front in Europe that year. Meanwhile the German army had broken through the Caucasus and threatened Russia’s principal oil fields. The news Churchill brought incensed Stalin, but their relations improved when Churchill spoke of the bombing of German cities. He also promised a second front in North Africa. 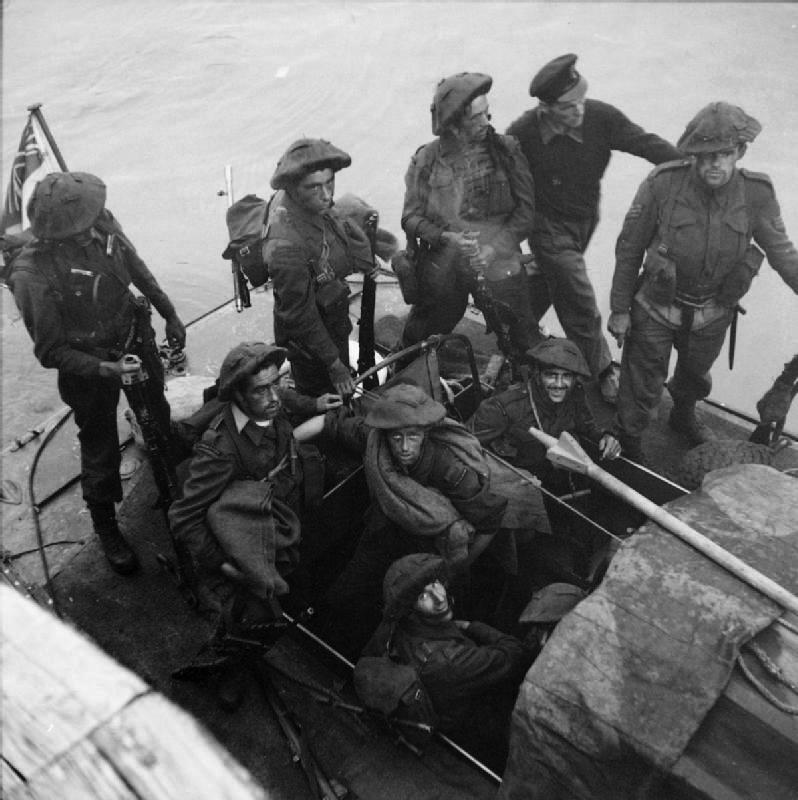 On the evening of 18 August 1942, almost 6000 men, 80 percent of them Canadian, left for Dieppe. About 250 small naval craft transported them. On the following morning, seventy-four air squadrons augmented the force. 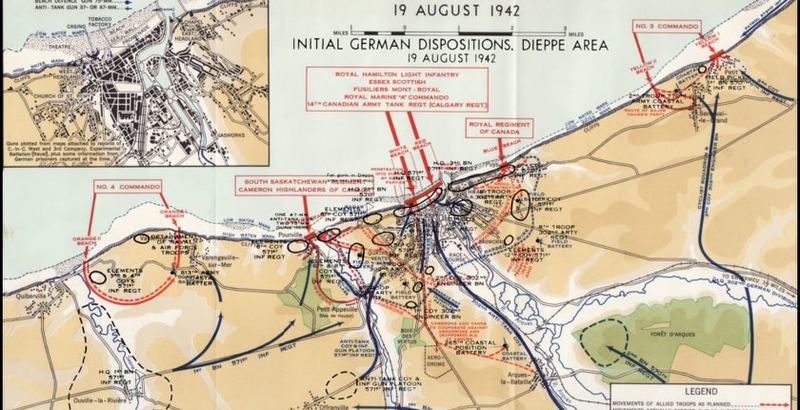 Unbeknown to the Allies, however, the Germans were on alert that summer, though there is no evidence they expected Dieppe to be targeted. Unexpectedly, a German convoy making its way to Dieppe from Boulogne spotted the ships. A battle ensued, the firing alerting German troops on shore. This cost the key element of surprise. Problems next arose when the Navy disembarked some troops at incorrect locations, from where they were unable to carry out their objectives. Stronger forces defended the port, much stronger than expected. Tanks had trouble proceeding on the pebbled shore. General Roberts, the on-scene commander, lost wireless communication with his forces. Roberts received fragmented information that the first wave was successful. Thus he ordered a second wave ashore. While some forces did reach the town, the bulk never left the beach. Many were killed or wounded. It was soon apparent that the key mission to take Dieppe and destroy the port facilities was not achievable. Under terrific German fire from the cliffs around the port, the troops withdrew, taking more casualties. It was a disaster. Canadian troops numbered 4963. Only 2104 returned to England, many wounded; the raid saw 913 killed and 1946 captured. Churchill wanted Ismay to ascertain the facts, after which he would decide whether to hold a formal enquiry. Churchill did not pursue the matter, but after the war, preparing his memoirs, he asked Ismay for a full explanation. Who, he asked, was responsible for reauthorizing the raid in August? Ismay was unable to find the answers. He did reply that Churchill must have approved the plan in principle, because he cabled two days beforehand using its codeword. Mountbatten had made General Roberts the scapegoat for the disaster, ignoring the fact that the commander was “flying blind” for much of the time. Alarmed over Churchill’s probing, he provided Churchill with a voluminous response, defending his own actions. In the seventy five years since this disastrous episode historians have attempted to justify the horrendous loss of life. David O’Keefe has a new slant: that the main objective was to secure a four-rotor enigma machine. This is refuted by other historians. O’Keefe now includes the sensationalist claim that Churchill was one of the guilty parties. Churchill had valid reasons to favour the raid on Dieppe. Principally, the Prime Minister wanted to attempt to take pressure off the Russian front. But for planning and conduct of the raid he had to rely on his military and naval experts. Clearly their plan suffered from insufficient due diligence. Many disparate components needed to mesh for success. This was unrealistic. Together with shortcomings by the naval component, and communication problems, the result was inevitable. 1 Winston S. Churchill, The Grand Alliance (Boston: Houghton Mifflin, 1950), 606. 2 Terence Robertson, The Shame and the Glory (Toronto: McClelland & Stewart, 1962), 20. 3 C.P. Stacey, Six Years of War, Official History of the Canadian Army in the Second World War, 3 vols., (Ottawa: Queen’s Printer, 1966), I 335. 5 Martin Gilbert, Winston S. Churchill, vol. 7, Road to Victory: 1941-1945 (Hillsdale College Press, 2013), 198. 6 Winston S. Churchill, The End of the Beginning (Toronto: McClelland & Stewart, 1943), 205-06. 7 David Reynolds, In Command of History: Churchill Fighting and Writing the Second World War (London: Allen Lane, 2004), 345. Mr. Reardon is a long-time director of the International Churchill Society of Canada and author of Winston Churchill and Mackenzie King, So Similar, So Different (2012).